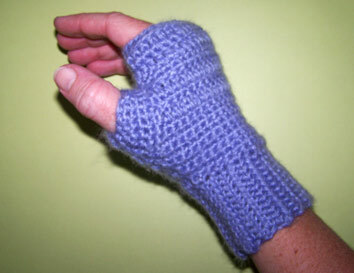 Ah, also if I leave the position tactfully referred to as ‘between novels’, I might need two fingerless gloves while typing. I suspect I’ll leave winter first. And in the meantime, my mouse hand is freezing while my other hand gets to tuck down into my warm lap between typing stints. Yep, my hands are this chunky. The pattern is pretty simple, so jump to the full post if you want some more info. I used a 4mm hook. Don’t ask what yarn I used, it’s from a bag of abandoned balls of various colours. I have no idea what it is, other than that I suspect one of my blog-sisters once made a jumper from the stuff. It’s purple, my dressing gown is purple, I’m cold at night while wearing my dressing gown at the computer. Now I coordinate in such a stylish fashion. The cuff is a mini-scarf of dc (double crochet… unless you are American, and you call it single crochet), seamed inot a short tube. Then you continue by stitching around one open end of the tube. Cuff seamed up, ready to start on the hand section. The pattern says to make 32 stitches and continue with that number. I put in as many as fit, and then increased over several rows because, like the GP said, I have mannish hands. They definately are not the same width as my wrists! Leave a thumb gap by turning for rows instead of continuing to create circles, then join the circle again and continue to the desired length. I subbed in some rows of treble (US dc) and decreased over the last couple of rows so it didn’t open out too much around the fingers. I noticed that when on, it was way longer on the little finger side. So I’d recommend checking for that and, as I did, working a row or two with trebles on the thumb side reducing to dc on the little finger side. As a devoted avoider of ending and beginning threads, I slip-stitched down to the thumb opening to add the rows of dc around there. It starts with about 22 stitches and reduces at the bottom end every row. I did a couple of rows slip-stitching across the ‘top’ of the thumb because I wanted the bottom side to end up longer without the top end getting longer. As you can see, when lying flat it appears longer on the thumb side, but when worn (on me anyway) it evens out. So there you have it. My first crocheted glove. My son has requested a pair and I’m already considering options for improving the pattern to suit my needs, so there may be further updates.